I found this prototype model of an advanced safety scooter, the ASV-3, which was made by Yamaha Motors. The article is already a year old. The difference in this scooter compared to the normal scooters we have on the road is that the ASV-3 has a multi-chambered airbag which opens from under the seat. I am not sure what the airbag was meant to do. I would guess that it is to prevent the rider from sliding forward in a collision thus hitting the handle bars and causing the rider injury. However, Geekologie feels that it could be used as a crotch guard. 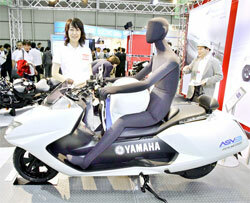 I do not know how the crotch airbag works but it looks dangerously close to the rider’s groin area. I’d imagine the airbag causing more harm than good to the rider instead. Can you imagine what will happen if the rider were to sit an inch or two closer to the front and the airbag were to expand in such a fast rate thus hitting him in the groin?